Sailing-yacht cabin charter with Croatia Yacht Club means that you, along with a group of six to ten people plus crew, get the opportunity to explore and fall in love with the magnificent croatian archipelago on a sailing-yacht from 35 to 53 ft. Whether you are an experienced sailor or a marine novice is of little importance on a voyage like this since you will have a skipper who is fully responsible for both the boat and the crew, as well as a hostess to care for matters of cooking and making sure that you are all as comfortable as possible. Aboard the boat it is up to you to decide to what extent you would like to participate, meaning it is up to you to decide whether you would just like to sit back and relax or be involved in sailing the boat. Each night will be spent in either a natural bay or a marina, always with a restaurant nearby. The route that you will be sailing is planned beforehand but there is of course room for change, either in accordance with your suggestions or due to weather. The starting marina for the trip varies depending on in which marina the boat is located. Included in the trip is first and foremost a berth on the boat and a flight from Stockholm, Gothenburg or Oslo. Transfer from the airport to the marina is included as well. Furthermore, the trip includes breakfast and lunch, prepared by your hostess and such costs as marina fees, diesel and a comfort package for the boat. 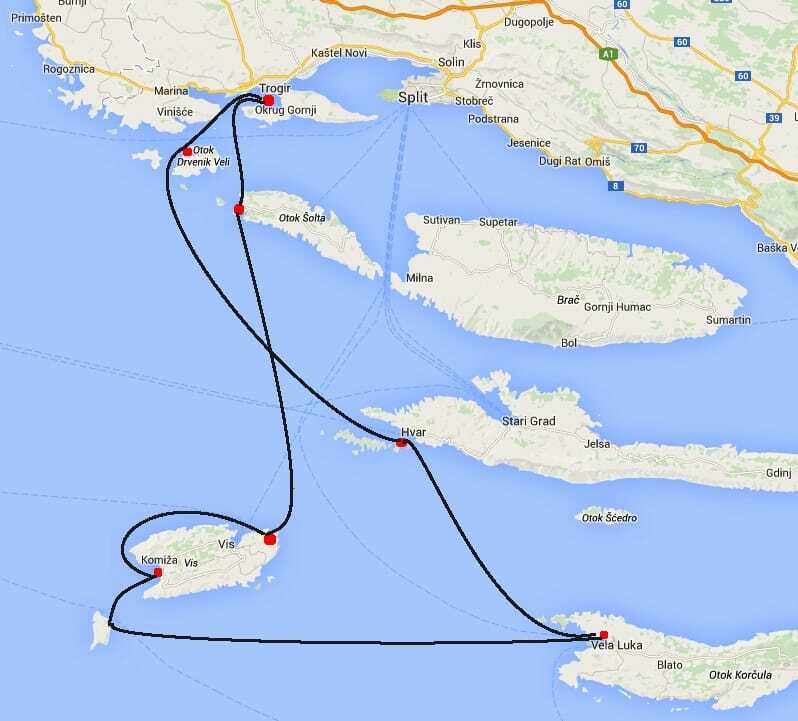 Do you want to go sailing in Croatia but your family/friends can not accompany you? Then cabin charter is perfect for you because the trip is booked individually. Naturally you can book a trip for two or more as well but it is by no means a necessity. Those who make a single reservation will be sharing a cabin with another guest. Unless you are not comfortable with this, in which case it is possible to book your own private cabin. Croatia has close to five million inhabitants, the capital city Zagreb and the coastal city of Split as its’ largest cities. The language spoken is Croatian but people generally speak English and/or German as well. Our base marina is in Trogir where we have a wide fleet of boats in sizes ranging from 33-53 ft.
Other than in Trogir we have boats in marinas going all the way from Split in the south to Zadar in the north. Round-trip flight tickets, transfer from the airport to the marina (and back), a berth, breakfast and lunch for 6 days, skipper, hostess, marina fees, diesel, liquid-gas for the kitchen, linens and cleaning service. The yachts are well-equipped and well maintained, size varies depending on the size of the party but is usually between 40 and 53 ft.
A day usually start with the crew taking a dip in the ocean while the hostess is preparing your breakfast buffé. The skipper casts of with the help of those onboard who wish to participate and you sail for a few hours before finding a nice bay in which to drop anchor and have lunch. In the afternoon you continue sailing for a few hours until you reach the bay or marina in which you will stay for the night. The evening is then spent having dinner at a local tavern. Bathing shoes, beach towel, sun block. The suggested route will be followed to such an extent possible given weather conditions or if the crew has alternative suggestions we are of course flexible. You will find that the Croatian archipelago is full of small villages with their characteristic stone-houses, small coiling streets and beautiful alleyways. Tremendous taverns, lively market-places and warm, welcoming people constantly reminds you of the Medeterranean lifestyle. Day 6 – Drevenik V.